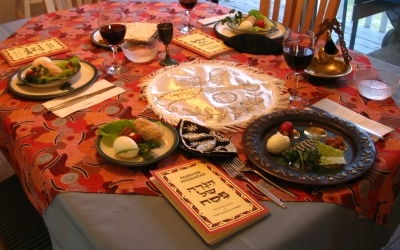 Pesach is a highlight of the Jewish year, but what makes it memorable for you? Stepping back in time and using dishes from years gone by were favourite Pesach experiences for others. Volunteer Sarah Adler has kitchenware first used in her grandparents’ home more than 100 years ago. In those days pans were made to last because Sarah still makes her chicken soup in their stock pot – which she cooks in her oven all night long. Seeing loved presents again is the most magical part of the festival for JWeb’s Anna Perceval. “My beautiful Seder dishes have been special gifts over the years,” she said. An unconventional custom of adding chrain (horseradish sauce with beetroot) to chicken soup is a Pesach family custom for Projects Coordinator Colin Spanjar. “This is a Dutch tradition but tends to freak people out if they have never seen it before,” he admitted. Whatever Pesach highlight is your own, enjoy it and we wish you chag kasher v’sameach!